Lotus Blossom Tank KAL: Put a fork in me! I am done! Well, I still need to wash & block this bugger and get DH to take a pic of me modelling (hah!) this thing, but the knitting is done. Well, I hope I'm done. 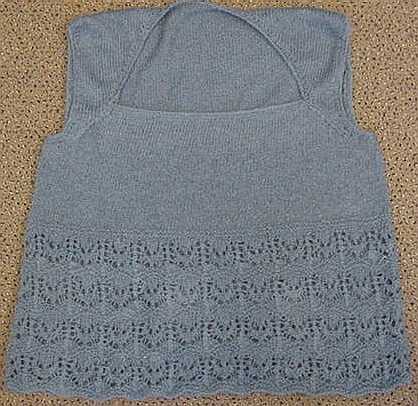 I did not enjoy picking up and knitting the finishings on the armholes and neckline. I simply had the worst time w/the SWTC Bamboo at this point. I hope the most egregious parts block out. If not, I'll have to go back and re-do them. Gah! 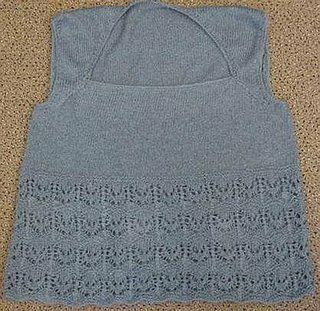 In any case, a quick recap of my tank - I knitted the size 39'' cause I measure 40." I got stitch gauge on size 7 (Boyes interchangeables) needles, but my row gauge was bigger (7.25 rows/in vs 9 rows/in stated in the pattern) in St st. Because of my larger row gauge, I only added 1.5" to the St st portion before splitting for the armholes and felt no need to add a 5th repeat of the alien heads. Quick thoughts on this project - This was a fun pattern to knit. However, my enjoyment was tempered by the yarn itself. While I like the drape and feel of it, it still got tiring for my hands despite having more give than a 100% mercerized cotton yarn. It didn't bother me while I was doing the lace portion, but the knitting the St st portion got wearying. Oh, and yeah, splitty as heck. All of which is probably why I started losing steam and got really annoyed doing the armhole and neck finishing. I really hope the finish blocks out okay, 'cause I really don't want to go back and re-do them. Now what do I do w/the 2 whole leftover skeins + the remainder of the 3rd? Your LBT is just stunning. Can't wait til mine is needing a fork as well! It's so AWESOME! You did a great job. It looks so....smooth. Mine looks all lumpy. Damn. Anyway, I completely agree with you re: the yarn. It's so stiff, and I've been splitting it too, albeit with my pointy Boyes. Still, I really like the feel of the fabric produces. That is such a pretty colour! And it looks beautifully made. I hope wearing it and receiving lots of compliments will make up for the trials and tribulations you had in the process of knitting it! I've had plenty of splitting problems, but your FO is an inspiration to keep on going. Great job, it's very pretty!